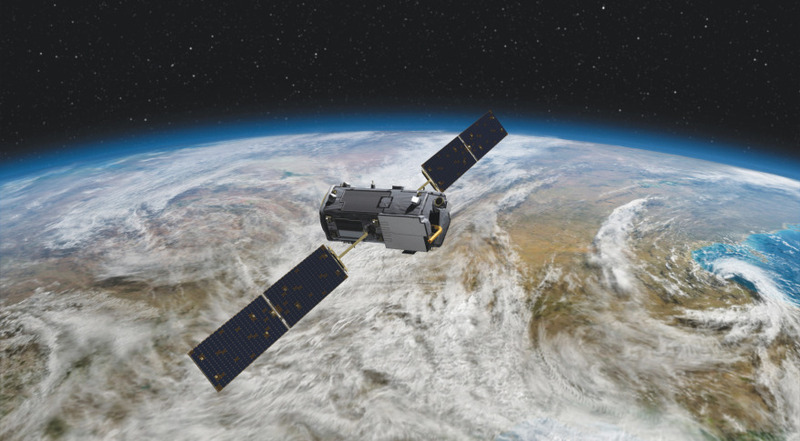 BREMEN, Germany — As a growing number of organizations propose satellites to monitor greenhouse gases, national space agencies who already operate such spacecraft welcome those new entrants — as long as they’re willing to share their results. Missions to track emissions of such gases by human activities, once solely in the realm of major space agencies, are now being considered by state governments, non-profit organizations and companies, seeking to leverage advances in small satellites to fill perceived gaps in what data is already available. One company, Montreal-based GHGSat, announced Sept. 24 it has raised $10 million in what it called a “Series A2” funding round. The funding, the company said, will expand its commercialization efforts and fund an additional satellite. The company launched one satellite in 2016 and plans to launch two more next year. The funding round for GHGSat came 10 days after California Gov. Jerry Brown announced the state would develop and launch its own satellite to track greenhouse gases. “This groundbreaking initiative will help governments, businesses and landowners pinpoint – and stop – destructive emissions with unprecedented precision, on a scale that’s never been done before,” he said in remarks at the Global Climate Action Summit in San Francisco Sept. 14. The satellite will be developed by San Francisco-based Planet in collaboration with the state government “and others,” Brown’s office said in a statement. Neither the governor nor the company disclosed additional details about the proposed satellite, including its cost, funding source or schedule. That spacecraft is designed to be complementary with another privately-developed spacecraft, MethaneSAT, that the Environmental Defense Fund (EDF) announced in April it planned to fly to track emissions of methane, another greenhouse gas. So what do national space agencies like NASA, who already operate Earth science missions that monitor greenhouse gas levels, think of these new entrants? However, neither NASA nor other national space agencies are turning over the efforts to track greenhouse gases to other organizations. During the panel, Freilich highlighted the results from NASA’s Orbiting Carbon Observatory (OCO) 2 spacecraft, which monitors natural processes that regulate carbon dioxide levels in the atmosphere. “We are seeing the Earth breathe,” he said. NASA is also preparing for OCO-3, a follow-on instrument made from flight spares developed for OCO-2. While the White House proposed cancelling OCO-3 in its fiscal year 2019 budget request, Freilich said the instrument is ready for launch to the International Space Station next February. Installing OCO-3 on the ISS, which is in a 51-degree orbit rather than the sun-synchronous orbit most Earth science satellites fly in, will provide a new perspective on carbon dioxide changes. While such satellites pass over locations at the same time each day, OCO-3 will see locations at different times of day and night. “OCO-3 measurements, over time, will allow us to resolve issues of the diurnal cycle of CO2 in the atmosphere,” he said. The Japanese space agency JAXA is preparing for the launch of the Greenhouse gases Observing Satellite 2, or GOSAT-2, which is designed to measure carbon dioxide and methane gases at far higher precision than its predecessor, GOSAT. GOSAT-2 is scheduled for launch on an H-2A rocket on Oct. 29, said Naoto Matsuura, senior chief officer of satellite applications and director of JAXA’s Earth Observation Research Center, on the panel. Matsuura added JAXA is starting work on another satellite, GOSAT-3, in 2020. “We have started to contract for its development,” he said. Josef Aschbacher, director of Earth observation programs at the European Space Agency, said the Sentinel-5P spacecraft launched a year ago is providing “extremely good daily measurements” of greenhouse gases. That will be followed by the Sentinel-4 and -5 missions, which will be carried on weather satellites operated by Eumetsat. He added that ESA is considering a future Sentinel mission dedicated to carbon dioxide monitoring.